The SIPA | Brokers Beware! As one of the leading voices of Registered Reps and their rights to Life, Liberty and the pursuit of higher returns, The SIPA has had an out pouring of e-mails and phone calls from Individual registered Representatives who are now being made the brunt of this cruel Bail-out Blarney. As everyone knows by now, Bernie Madoff wasn’t the only one in town who figured the regulators weren’t looking. 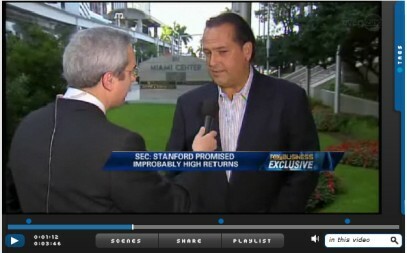 Recently the SEC revealed that another Ponzi scheme in Texas was being perpetrated by none other than Alan Stanford. The scary thing about this is not that he stole money for years without any regulatory intervention, but rather the fact the honest hard working Brokers tried to stop this and were turned away. Click the image below to see the interview in its entirety. Here is an honest and hard working Broker who is concerned for his clients, concerned for his firm and when he goes to his Compliance Officer he is shown the door and more shocking is that when he went to his regulator he was ignored. Every broker should be taking steps right now to document each and every conversation and concern you have with your Supervisors and your Compliance officers. Do not for a second assume that just because your compliance officer signed off on something that your job is done. Right now it’s every man for himself and it appears that brokers may be the easiest thing to throw under the bus. For instance, we recently heard from a top five Wall Street firm Broker that he had his Form U-4 marked for the first time in 20 years due to a complaint that he “bought FNMA preferred stock for his client three years ago”! It was recommended by this will known company and was triple A rated yet due to the collapse on Wall Street, he is now being treated like he is a boiler room caller in Long Island selling time shares for land in Wyoming!.